There are plenty of benefits bundled into PrinterLogic, and one of them is its adaptability. It can be deployed effectively in a whole range of enterprise print environments regardless of their size, sector or setup. Sometimes, however, it’s helpful to take a deeper look into how PrinterLogic fares in enterprise environments specific to a particular industry. 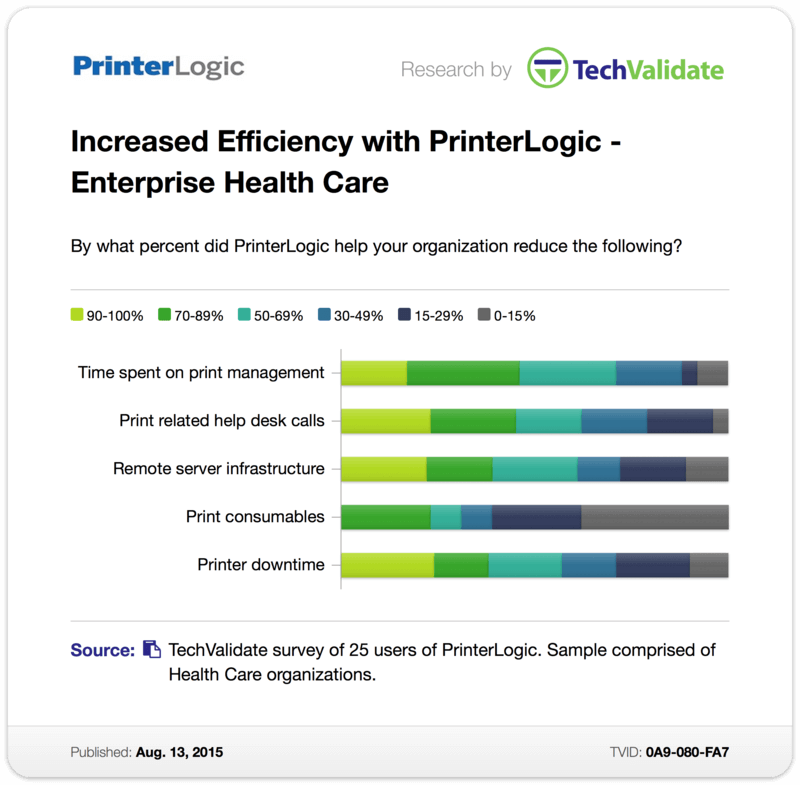 Thanks to a recent survey of PrinterLogic customers conducted by the independent research firm TechValidate, we’ve been able to examine the experiences of our health-care customers once they’ve installed our enterprise print management software. And the results are persuasive. 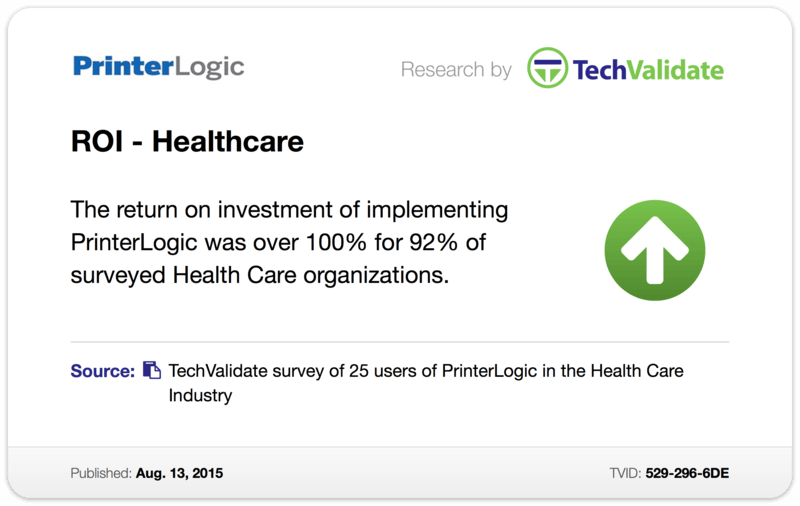 For an incredible 92% of respondents in the healthcare sector, the return on investment (ROI) after implementing PrinterLogic was greater than 100% (TVID: 529-296-6DE). Wow. To think of it another way, for almost every single health-care organization that deployed PrinterLogic, the solution did more than just pay for itself—it practically earned them money. Wait, what? How can that be? It comes down to the aggregate cost savings that PrinterLogic is capable of achieving in a variety of areas throughout your enterprise print environment. For example, close to three-quarters of these same health-care organizations saw a reduction of 50% or greater in the time spent on print management (TVID: 0A9-080-FA7). A majority—62%, in fact—also watched their print-related service desk calls drop by half or more. As many as 23% saw a reduction in service desk calls by an astounding 90–100%! In practical terms, that means more IT staff who are using their time at work for tasks other than troubleshooting printer deployments. They’re more productive, they’re more efficient, and they can spend more time optimizing other aspects of the IT backbone. Speaking of productivity, just shy of one-quarter of these same respondents experienced a reduction in printer downtime by 90%–100%! Well over half (57%) saw downtime reduced by 50% or more. What does that look like on the ground? It means that employees can print exactly when they need to, enabling them to accomplish more and deliver a better customer experience. Behind the scenes, PrinterLogic works to trim the costly accumulated fat from your print environment. Almost 40% of the survey respondents said that PrinterLogic allowed them to reduce their remote server infrastructure by 70% or more. That cost-cutting diet can often take the form of print servers, now made superfluous, or additional management solutions that PrinterLogic’s all-in-one package replaces. And many of those efficiencies are ongoing. Almost one-quarter of those surveyed witnessed a 70–89% drop in print consumables usage. That’s like going from using ten toner cartridges per month down to three (or less). Or from 100 reams of paper down to less than 30. Now imagine those cost savings multiplied across the breadth of your entire organization, month after month. That’s how PrinterLogic helped these organizations see such amazing ROI. What’s more, to generate those stats, they didn’t have to jump through all sorts of hoops hidden in the fine print. This is what PrinterLogic helps you achieve right out of the box. For health-care organizations wanting to tame their print environment, the best medicine looks to be PrinterLogic.